I'm a huge fan of any models that find applicability beyond their intended domains and there are few quite as versatile and useful as The Hedgehog Model. In his seminal book "Good to Great", Jim Collins examines 1,435 businesses over a period of 40 years in order to answer the question "what separates the good companies from those which make the leap and become great companies?" Over the course of his analysis, he uncovers a variety of factors that drive this distinction but one of the most fundamental concepts he explains is "the Hedgehog". This idea is based on a fragment attributed to the ancient Greek poet Archilochus which says "a fox knows many things, but a hedgehog one important thing." Both these animals have survived successfully by deploying greatly different strategies. The fox is clever -- she knows a great many things and tends to rely on her intelligence to hunt and survive. The hedgehog is a far simpler creature -- when she is threatened, the hedgehog simply curls up into a ball and points her spines outwards. As a bottom-up guy, I've always needed to see the gears working to trust that the machine will do what I say it will. More than that, I believe that understanding the machine provides an unmatched power to deploy it. So to confidently build a web-based tech business, I had to start by learning web development. But as important as that is, it's also easy to get caught up in the sprint and lose sight of the greater goal. Spending nights and weekends feverishly coding sure feels like a productive use of time and it can be a fantastic creative outlet but it isn't the optimal path to building value. Recalling the Simple Model of Value Creation I laid out before, I've so far been learning the skills of a producer, the most granular level of value. It's an incredibly important skill set -- the best generals were soldiers and the best founders were product grunts too. In the service of creating value, there are three major levels of specificity -- Producer, Product, and Enterprise. Think of it like a series of concentric circles. As you move from the inner circle of Producer to the outer circle of Enterprise, you greatly increase your value creation leverage. 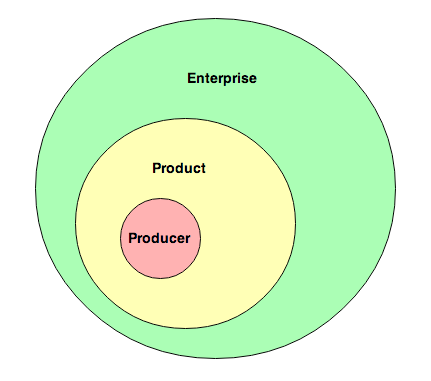 A Producer, for instance a coder or designer, is the most granular unit of production. A producer represents the deployment of a skill or set of skills. Though talents vary, the leverage of this individual is 1. Producers form the backbone of value creation and the ideal producer is one who has achieved expertise in their domain but also understands where that fits into the overall product picture.